As an artist of impulse Toledo enjoys working with acrylics due to their fast-drying nature and her paintings are large, her colors strong and her themes bold. Toledo has always been highly influenced by her surrounding environment and those themes have been rigorously applied to her artistic work. Largely influenced by her own history of travels from Tanzania to San Paulo Brazil and now Dubai, she takes inspiration from the Baroque art of Brazilian churches, sacred art museums and antique markets, and throughout her school years Matisse. She was fascinated by the Fauve moment during her time at Art School in San Paulo where she graduated in painting and photography. For her moving to the Middle East was an artistic challenge. 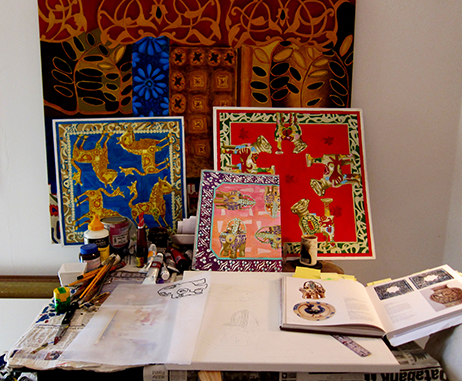 Initially, she was inspired by the old souks and villages and mashrabia windows. Now her style has combined both architecture and patterns from the Middle East with her Brazilian palette, resulting in vibrancy and intricate detail of design. 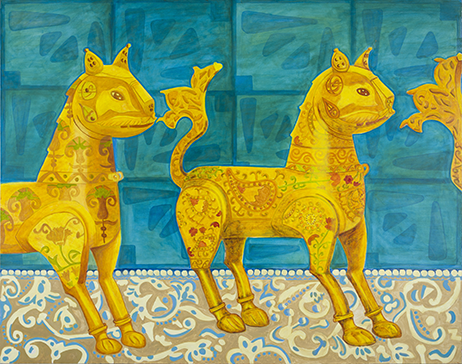 These elements of design are taken from Islamic embroidery and the repeated figures captured are inspired by 12th century museum pieces from the Islamic world. Kate Toldeo has won several prizes for her work in San Paulo and Italy, and has exhibited in three countries. Her latest project is a series of silk scarves, the designs of which were available at dXb Store in March 2013. This Autumn Capsule Arts will launch a set of limited edition art prints by Kate Toledo that will be available to purchase at capsulearts.com, for more details about her featured artworks and the launch collection sign up here.